Why Use MAZU 's Indoor Pest Repeller? - PROTECT YOUR HOME from unwanted pests without using dangerous chemicals, sprays or traps that can harm you, your family, your plants and animals. - Works for Rats, Mice, Ants, Roaches, Spiders, Bugs, Fleas, Bats and much more. - Save Thousands of Dollars while driving away Rodents without using any kind of poison, risky traps, or chemicals that smell horrible and burns your eyes - Use one unit per floor . - A combination of ultrasonic and electromagnetic functionality drives away mosquitoes,mice, most insects and more in the most humane and environmentally friendly way possible. Simply Plug In To Your Home, Garage, Office or Supermarket To Get Rid Of Unwanted Pests! MAZU Ultrasonic Pest Repeller, Repels pests forever. Are pests living and growing in your home, between the walls, in the kitchen, in the office? It is normal that the mouse ad vermin will increase at the beginning of the using day .Because they will move away from their living place after the attack of ultrasonic. 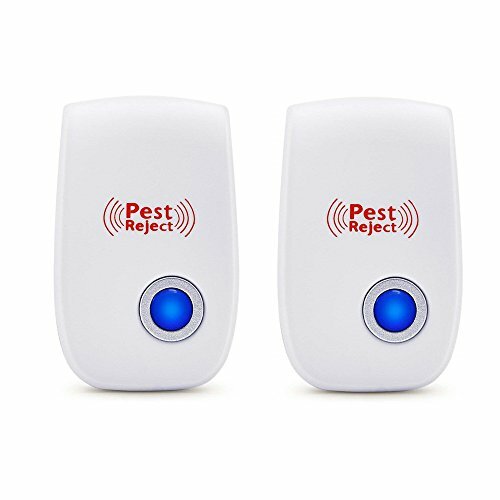 *DRIVES AWAY SPIDERS,MOSQUITOES, MICE, ANTS,ROACHES: - Ultrasonic pest repeller is an unique electronic pest repeller that is effective against all insects,mice and rodents. *SAFE AND RISK FREE:No Harmful toxins or chemicals- pet and child safe.Mouse yelling on mouse .mosquito insect.stimulated can be very large to drive to good effect by Bionic wave. *ENERGY EFFICIENT : MAZU electromagnetic pest repeller protects your home in a non-toxic way, completely harmless to pets and children. *LARGE COVERAGE AREA: The effective range of the Ultrasonic Pest Repellent is from 50 to 80 square meters in the room. We recommend to use one unit per average-sized room with a pest problem for best results.Usual 3 to 4 weeks can see the effect.